Twirlywoos, the hit CBeebies show, has the Big Red Boat at the heart of all the action. Living in it are the four little bird-like characters of GreatBigHoo, Toodloo, Chickety and Chick. They all have inquisitive minds and get up to all sorts of adventures. 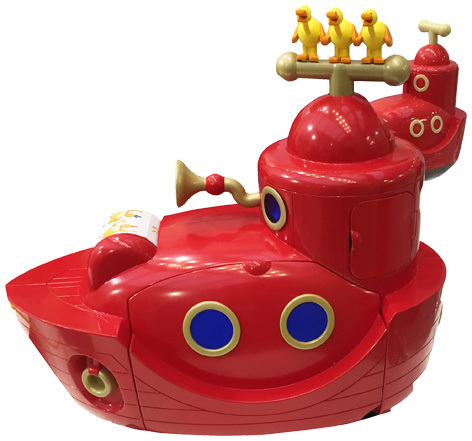 Golden Bear hold the master toy licence, and their version of the Big Red Boat is a masterpiece that all the shows fans will want to own. Packed full of stimulating and innovative play features, this huge playset also includes a version of the famous Fruit Tea Machine. Opening doors and hatches as well as electronic sounds and phrases can all be activated from various points on the boat. A pull along feature means that kids can easily move from room to room and play with their favourite toy anywhere in the house! Please tell us what you think of the Big Red Boat by Golden Bear. My son needs 1 now! This looks great. My little boy (14months) absolutely LOVES Twirlywoos and lights up as soon as they come on the TV. Would love to get him some products to play with.